Vlad the Impaler was immortalized with Bram Stoker's book Dracula. But, is there any truth to it? Was Vlad the Impaler really a blood-thirsty vampire that sucked people's blood during the night? We will differentiate myth from reality in this article. Born in Transylvania during the winter of 1431, Vlad Tepes (also known as Vlad the Impaler or Dracula) was the second son to his father Vlad Dracul and his mother Princess Cneajna of Moldavia. 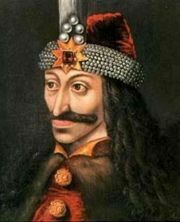 Vlad Dracul, before Vlad Tepes was even born, belonged to the Order of the Dragon and eventually he became known as Dracul - meaning "Devil" in Romanian. What he did to be called such a name, I leave to your imagination. Tepes in Romanian means "impaler". Vlad Tepes, when prince of Wallachia, gained a reputation for being a very cruel leader. Throughout his life, he killed anywhere from 20,000 to 300,000 people. He showed no mercy and almost invariantly tortured his victims before killing them. Therefore, he was both feared and loved throughout modern day Romania. When he was imprisoned, he enjoyed to torture insects. With sticks, he'd impale them slowly - just like he did years later with real people. With difficulty, he became prince of Wallachia and, with the hate his father had against the rising Ottoman Empire, he conducted many campaigns to conquer their land. One time when he defeated an Ottoman army and took more than 20,000 prisoners, he ordered all of them impaled. Vlad's favorite form of torture, impalement, consisted of forcing a victim to sit on a sharp and thick stake. The rank of the victim determined how high the stake was erected with servants being a few feet above the ground - just tall enough so when their feet reached the soil, they'd already be dead. According to some historians, when Vlad left the 20,000 enemy soldiers to rot, another army came looking for him. They cried when they saw the "forest of rotting men" and promptly returned home. Vlad especially enjoyed to have a feast while he watched his victims be tortured. In one story, when Vlad asked a noble member whom he was having the feast with if he liked the smell of the rotting men and the man said no, Vlad ordered him impaled higher than anyone else so the "smell wouldn't reach him". Vlad was known for enforcing honesty throughout the his land. He showed no mercy at all. When someone was caught stealing or, even worse, lying, Vlad ordered him impaled. Another target of Vlad was women. He especially enjoyed cutting their sexual organs sometimes for adultery and other times for no reason at all. Even though hated by many, Vlad managed to rule for many years. He eventually died in battle or betrayed by one of his own - nobody knows for sure. What happened to his body is full of myth; nobody knows for certain where he was buried and some insist that he wasn't buried at all and that he still lives to this day. Of course, I leave that for you to decide. -Dracul means "Devil" in Romanian. Dracula means "son of Dracul" and therefore "son of the Devil". -According to some members of Dracula's castle (now non-existent, see below), Dracula was said to make a meal out of the blood and flesh that he collected from his impaled victims. -Dracula's castle is often said to be Bran Castle. Now we know for certain that even though Dracula stayed there a couple of times, his real castle, now in ruins, is located at Poenari only attracting a few devote fans of Dracula. It was built in a very strategical position surrounded by numerous trees which makes it very difficult to reach. -Vlad's first wife committed suicide, his brother was buried alive and his father was assassinated. Vlad was surrounded with tragedy which probably propelled his desire for blood. -It is a documented fact that Vlad's head was cut and taken to Constantinople to ensure the Turkish population that the reign of Vlad was truly over.